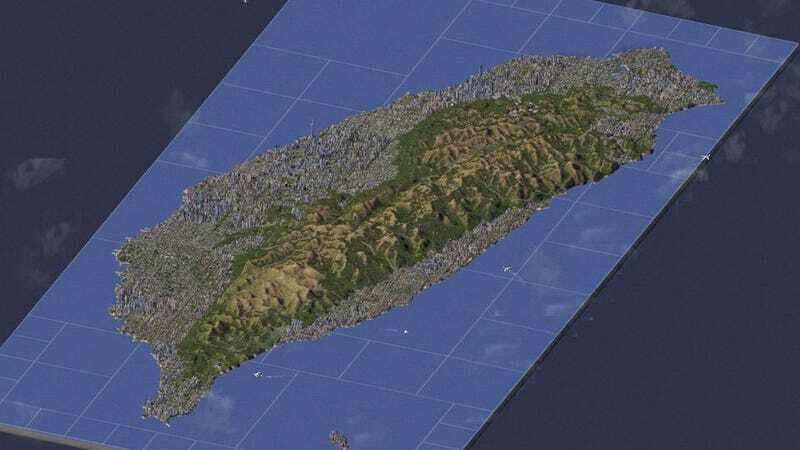 SimCity 4's world creation suite is a wonderful thing, allowing players fine control over the hills, valleys and rivers of their virtual building plot. It's so fine, in fact, people can try and recreate entire countries. In this case, Taiwan. OK, so it's a small country, but at 3,902 square miles and with a population of just under 25 million, it's not exactly a small hamlet or fishing village. This amazing creation was built by Reddit user sneakypanda86 over a period of around nine months, and while it doesn't use any cheats, it does use a mod or two, both for ease of creation and to get things looking a little more realistic. Note that it's not a literal copy—streets and city outlines aren't exact—but considering the way the game generates plots of land it still looks great.